Dialysis Unit Nephrologists, Nurses and Technicians; Home Hemodialysis Program Co-ordinators and affiliated staff admininstering this product in other settings if the product has been further distributed. Fresenius Medical Care Canada is recalling three (3) lots of 0.9% Sodium Chloride Injection USP, 1000 mL due to the potential for leakage of the interior solution bag. 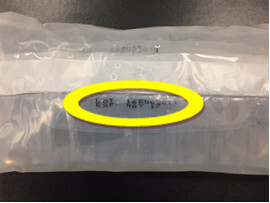 Leakage of a parenteral/intravenous solution bag for injection may result in a breach of sterility, microbial contamination, or air embolism from air introduced to the IV system. Fresenius Medical Care Canada is advising all users to immediately locate and remove the affected lots from use and return all affected inventory to Fresenius Medical Care (1-888-709-4411). The affected lots should not be used. Home hemodialysis programs should notify patients in their program about this recall without delay. Fresenius has initiated a recall of 3 lots of 0.9% Sodium Chloride Injection USP, 1000 mL due to potential leakage of the parenteral/intravenous solution bag. Leakage of parenteral/intravenous solution bags may result in a breach of sterility, microbial contamination, or air embolism from air introduced to the IV system. If used in IV admixtures, there is potential for delivery of a more concentrated drug solution than intended. These lots were distributed in Canada between Jan 04, 2017 and April 28, 2017. Fresenius issued a recall notice on May 10, 2017. *A fourth lot (16DU05064) was also impacted but it has expired. 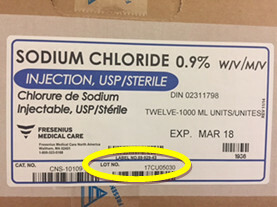 0.9% Sodium Chloride Injection, USP is indicated as a source of water and electrolytes for fluid replenishment as required by the clinical condition of the patient and is labelled for IV use as a single dose. Unused portions should be discarded. It is also used as a priming solution in hemodialysis procedures. Fresenius received complaints of leakage of the parenteral/intravenous solution bag of the specified lots; however, no adverse events have been reported. The root cause was determined to be a malfunction of one component of the bag making/sealing equipment. Fresenius has resolved the issue and product currently being shipped is not affected. Patients who have the affected lots in their homes should not use the affected lots and contact Fresenius Customer Service at 1-888-709-4411 (choose Option #2) to arrange for replacement product and return of the affected bags. Patients that only have the affected lot should also inform their health care provider. The specified solution lots should not be used. Please contact Fresenius Customer Service to arrange for return of the affected lots at 1-888-709-4411. Healthcare professionals should also notify affiliated staff administering this product in other settings. Home hemodialysis programs should notify patients in their program about this recall without delay. Fresenius has created a home patient letter describing the issue and steps to be taken by home patients and can distribute this notice on behalf of the clinic if requested to do so. Health Canada is communicating this important safety information to healthcare professionals and Canadians via the Recalls and Safety Alerts Database on the Healthy Canadians Web Site. This communication will be further distributed through the MedEffect™ e-Notice email notification system. Health Canada is also monitoring the recall and the implementation of necessary corrective and preventive actions. Managing marketed health product-related side effects depends on healthcare professionals and consumers reporting them. Any case of serious blood infection or air embolism or other serious or unexpected side effects in patients receiving 0.9% Sodium Chloride Injection, 1000 mL should be reported to Fresenius Medical Care Canada or Health Canada. To correct your mailing address or fax number, contact Fresenius Medical Care Canada QA/RA at cndqara@fmc-ca.com. The manufacturer advised Health Canada of the risk associated with this health product. Health Canada supports the actions taken by the manufacturer and as such a risk assessment was not required and a Summary Safety Review was not prepared.